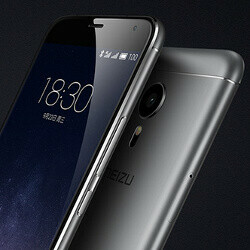 The Meizu Pro 5 is the new top-tier phone from Meizu, a company that has grown immensely in popularity in China in the past couple of years. It's a large phone: with a 5.7-inch Super AMOLED display, and it features a sturdy metal body that looks very stylish (and very iPhone-like, obviously), but probably the biggest highlight of this phone is its system chip. The Meizu Pro 5 comes with the Samsung Exynos 7420 SoC, the same chip that Samsung uses in its Galaxy S6 and Galaxy Note5. It's made using the leading 14nm FinFET process, and - quite interestingly - Meizu shows it beating Samsung's own Galaxy S6 in benchmarks. How does that Exynos 7420 perform on the Meizu Pro 5? Here are the official benchmark scores, published by Meizu itself, take a look below. Is it because of 1080p screen??? better cooling and "performance mode" for benchmarks similar to htc's. Pretty much. If people were willing to drag on pen gate for 2 weeks, no way Samsung would live if they used performance mode again. I have no issues with performance mode though. I think the whole point is to see what you can do at your peak. Apple on the other hand. They get away with anything. Sure the TW is. Samsung have a lot to improve regarding this. Well its 1080p vs 1440p. I bet they overclocked the chip. Not that it matters cause it's still Chinese crap. Meizu phones has option called "High Perfomance" which could be what they used in GeekBench. Yes, it has option called High Performance but do you know what that actually means? Meizu phones have 3 modes - Power saver, balanced and high performance. The difference is that in power save the phone is using only 4 cores, in balanced is using 6 cores and in performance is using all cores (in this case 8). So even if it is on performance mode it is still using the same cores as galaxy s6. Yea but they also increased clock rates of cores, keep that in mind. Very simple if you understand IT. 1. Drivers 2. Independent testing Drivers can make a huge impact, if you follow Exynos devices in past. It's expected, nothing out of ordinary. There is absolutely no relation between memory management and Geekbench memory test. Geekbench memory test tests the throughput of tasks, which are more related to bandwidth. It's due to the size difference and the 'performance' mode on the mx5. They artificially scale all cores to 2100 MHZ at all times to get higher benchmarks. Xiaomi also does this. i think you sould stop making silly statements. Especially if you have used Meizu MX5 with not any better memory management WHICH HAS NOTHING TO DO WITH MEMORY SPEED TESTS. Chinese are known for their lies globally. as if you are famous for your truth globally?